After counting down the weeks, days and then hours, the night finally arrived! My friends and I got dressed up for my friend’s and mine twentieth birthday celebration at the Culinary Institute of America’s Italian Restaurant, Ristorante Caterina de’ Medici! To say that I enjoy food would be an understatement. I’m a “live to eat person,” rather than an “eat to live person.” Friends have told me that they wished I loved them as much as I love food, and my grandmother has expressed concern to my mom that I talk about food too much. If you were to look through my “muploads” you would see mouth-watering pictures of desserts and baked goods. But anyway, I think you get the point; I really like to eat. So, needless to say, the CIA is an exciting place for me and I could not wait to celebrate my birthday at their Italian restaurant. In preparation for the big event my friends and I picked out our outfits the night before and looked up the menu online that afternoon. While reading the menu we realized that we were going to have to be a little adventurous in our ordering, but I was up for the challenge. 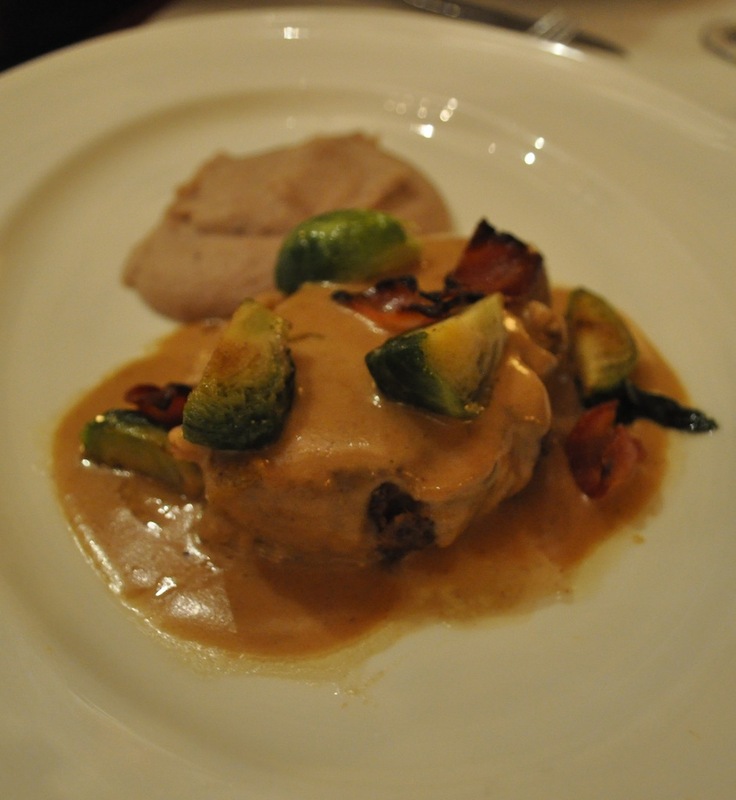 The dishes on the dinner menu included pheasant ravioli, stuffed quail, and braise pork shoulder. None of us had ever tasted pheasant or quail so, naturally, we Googled what they tasted like. Google told us that pheasant tasted like chicken with a hint of apple and quail had a nutty flavor. It also showed us some images of cute, colorful birds in the wild. So after doing our hair, and our research, the time we had all been waiting for finally came! The Culinary Institute is beautiful. The buildings on campus have red bricks, white pillars and tall windows with white molding. Ristorante Caterina de’ Medici looks like a Tuscan villa, and is located in the Center for Italian Food and Wine. The large dining room has high, dramatic ceilings with Venetian chandeliers hanging from them. When we arrived at the restaurant, the student greeters took our coats and we were seated at a round table located in front of large glass doors, where we had a view of the herb garden below and the library. Our waiter came over to our table and told us that he would be serving us tonight, and that it was his first night and to please bear with him because he is a very awkward person. He was not lying. Throughout the night, he awkwardly filled our water glasses, awkwardly replaced our silver wear, and awkwardly brought us bread baskets. We tried to make him feel more comfortable and loosen him up by making casual conversation. We found out his name was, Buddy. He reassured us that that was actually his name and that’s what it says on his birth certificate. I had to bite my tongue to make sure that I wouldn’t let any Elf quotes slip through my lips. When Buddy asked us what we were going to have, I ordered the Pizzella con Scarle e Mozzarella Campana to split with my friend, Kate, as an appetizer. It was absolutely delicious! 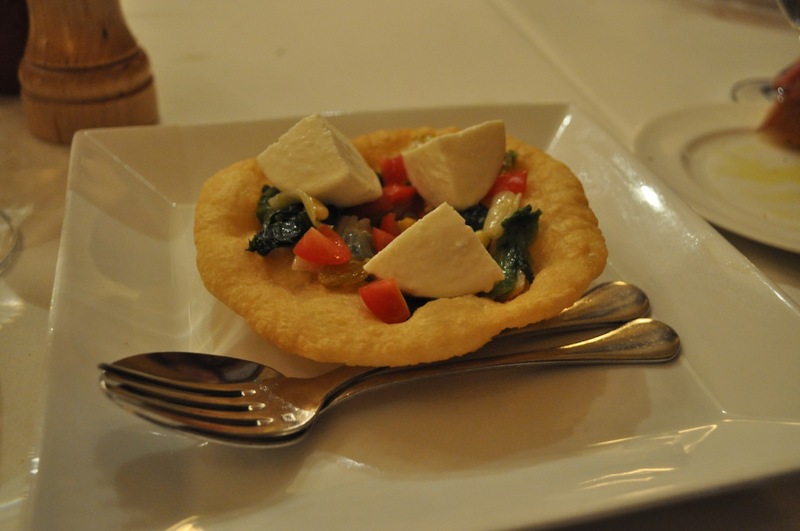 It was a fried pizza topped with garlicky escarole, yummy Buffalo mozzarella cheese, pine nuts and raisins. It was the perfect combination of salty and sweet and the dough was super flaky. It was so good that I kind of regretted sharing it with Kate. Deciding what to order for the main course was probably the most difficult decision that I had to make all week, maybe all semester. After weighing all of my options and changing my mind multiple times, I finally decided on the Maiale al Latte, milk braise pork shoulder, chestnut purée, and Brussels sprout (my favorite vegetable!). When all of our dishes came out, we ironically had to use the Olive Garden tradition and “pass our plates to the left,” because they gave us each other’s dishes. My meal was incredible! The pork was unbelievably tender and the chestnut purée was nutty and smooth with a subtle sweetness. After the staff came and cleared our table, Buddy came over and awkwardly asked if it was anyone’s birthday at our table. Sam and I both raised our hands and Buddy gave a shy smile and wrote it down on his note pad. He took our dessert order, another tough decision. Kate and I decided to split the tiramisu and the almond mousse with citrus salad, because we couldn’t settle on just one. 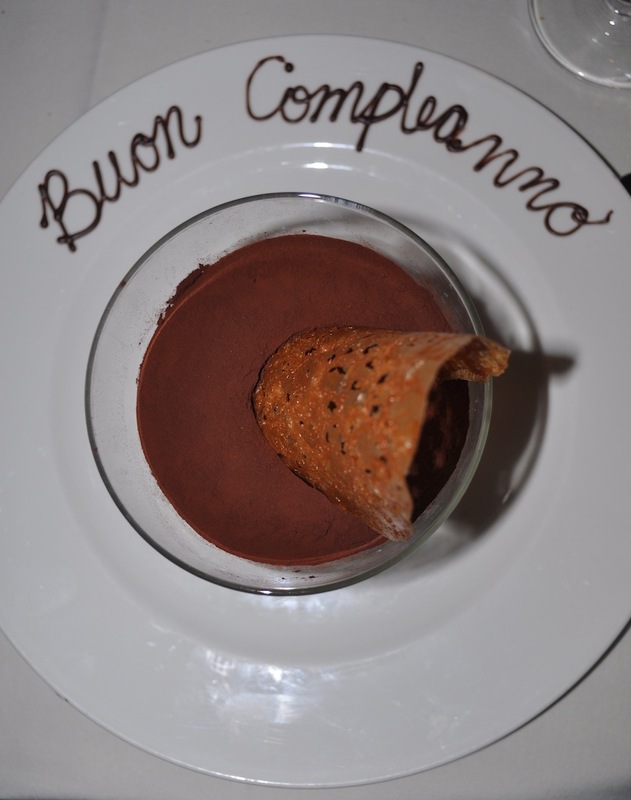 All of our desserts looked fabulous when they came out and they even wrote “Buon Compleano” in chocolate on Sam’s and my plates. Buddy also apologized, saying that he was supposed to ask about the birthdays more inconspicuously. 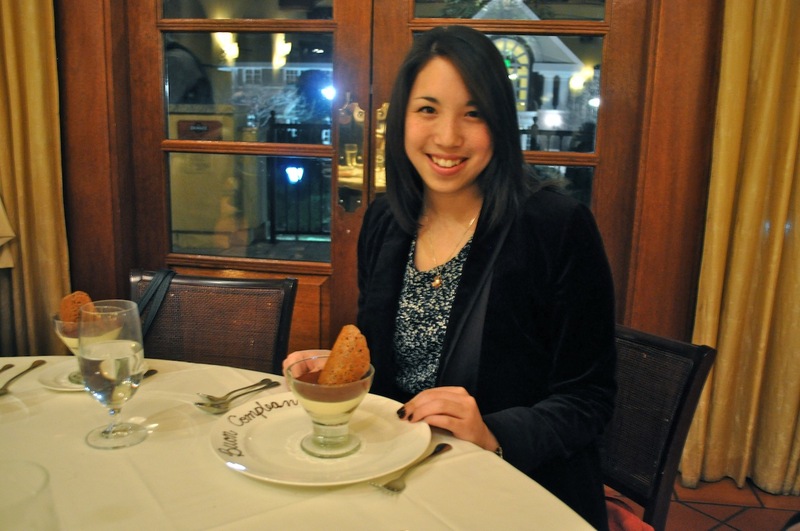 The tiramisu was awesome, but I enjoyed the almond mousse more. It was light, and sweet, and the citrus salad complemented it really well. The citrus salad included blood orange, Clementine, and grapefruit. I was very tempted to lick both dishes clean, but considering how classy the CIA is, I forced myself to resist the urge. The Culinary Institute of America definitely fulfilled, no, exceeded my expectations! I would absolutely recommend taking the five-minute trip up Route 9 to anyone looking for a great dining experience. The campus was beautiful and the food was delicious! I plan on going back and sampling a myriad of treats at the Apple Pie Bakery Café very soon. It looks tasty and delicious! Bon appétit! Ah, Dana. You make me proud. And hungry.